Other than the obvious difference of 12 solar cells, there are pros and cons to using 60 and 72 cells in different solar power systems. First a little background. Solar panels are made from blocks of silicon ingots that are cut into square cells. Those are the squares that you see that make up the solar panels. Each solar cell produces about a half a volt. Multiple cells are then wired in series, plus to minus, to make a solar panel. Wiring the cells in series increases the solar panel voltage to a usable level. The more cells that are wired in series, the higher the voltage. For example, if 36 cells are wired in series, you get an output of about 18 volts. The 36 cell solar panel that outputs 18V is perfect for charging a 12V battery bank, since you need a higher voltage to charge a battery. So, a 36 cell solar panel is called a 12V “nominal” panel, as it is designed to charge a 12V battery. Likewise, a solar panel with twice as many cells, 72 cells, outputs about 36 volts, and it is great for charging a 24V battery bank. So it is called? You got it, a 24V nominal solar panel. All was well and good with figuring out what nominal voltage solar panels to use, just make them match the nominal voltage of the batteries, when along came two different technologies that added an interesting twist to the mix. The first was grid-tie solar. With a grid-tie inverter, you could now convert the DC voltage from the solar panels directly into AC to power your house with no batteries required. So the restriction of 12V, 24V, and 48V went away. This allowed the solar panel manufacturers to use however many cells they wanted to. 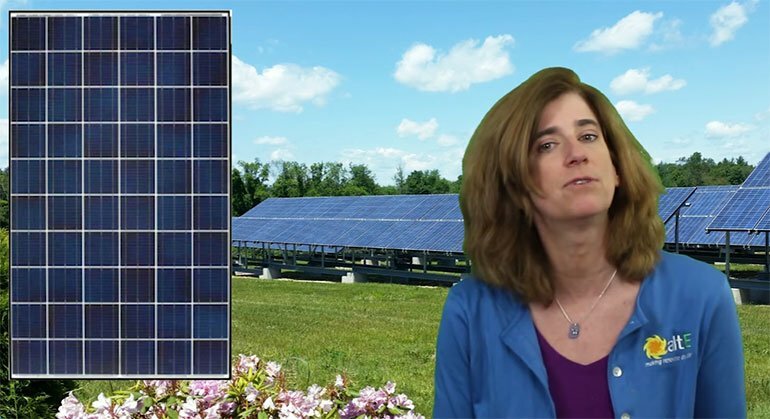 For solar panels up to about 300W, the industry settled on 60 cells. Using the terminology from the battery world, that’s a 20V nominal panel. With an Open Circuit Voltage, or Voc, of around 38V, grid-tie solar systems were able to string up to twelve or thirteen 60 cell solar panels in series and stay within the Electrical Code restriction of staying under 600V DC, even when taking temperature into consideration. If they were using 24V 72 cell panels, they would be limited to only 11 in series in cold environments, limiting their system size. The second change was in the battery-based world, with the solar charge controllers, used to manage putting the power from the solar panels into the batteries. Early on, the shunt or PWM charge controllers (Pulse Width Modulated) had to match the nominal voltage between the solar panels and the battery bank. MPPT solar charge controllers (Maximum Power Point Tracking) came onto the scene and allowed you to take a higher voltage solar input and reduced the charge controller voltage output to correctly charge a battery bank, while increasing the output current – eliminating any power loss due to forcing solar panels to operate at whatever voltage the battery bank was actually at. This opened up the ability to use any cell count solar panels, as long as the voltage was higher than the battery bank. Since 60 cell grid-tie solar panels are so common now, their price per watt has dropped much lower than the 12V panels, making them an attractive option to charge battery banks. Just remember you have to use a MPPT charge controller to do it. Also note that you cannot use a single 60 cell solar panel to charge a 24V battery bank. You need at least one 72 cell panel or two 60 cell panels in series to have a voltage high enough to charge 24V. So, what about the 72 cell 24V solar panels for grid-tie solar systems? Well, technology and codes move forward, and newer revisions of the electric codes now allow for 1000V strings for grid-tie commercial and utility scale systems. Also, grid-tie inverters are getting bigger and bigger, allowing for extremely high wattages getting inverted. Since watts equals volts times amps, a way to increase the wattage of a solar panel is to increase the voltage by adding additional cells. Adding those 12 additional cells generally adds a foot of length to the solar panel. With larger commercial and utility scale projects, larger panel sizes are able to be used. So, 72 cell panels give them a way to regularly make solar panels over 300W. Higher wattage solar panels reduce the number of panels that are needed in the system to reach your target wattage, which can decrease the labor needed to install them. Higher wattage panels may also reduce the amount of balance of system equipment needed, including racking, wire, and in some cases, electronics themselves, if they are using microinverters or DC Optimizers. Note that not all microinverters will support 72 cell solar panels, so 60 cell is still the only option in some cases, mostly for home systems. Most 72 cell panels still weigh less than the 50 lb restriction set by OSHA, so can be carried by one person, although their size can make it awkward to handle alone. The smaller 60 cell solar panels can be easier to handle. So…which size solar panel should I use? What size solar panel you should use for your project depends on a lot of criteria. Are you building an off-grid or a grid-tie solar system? If it is off-grid, what voltage battery bank are you trying to charge? Do you have physical size restrictions that would limit the size of the panel? Will the equipment you want to use support the solar panel? Will a higher voltage panel restrict the number of panels you can use in a system? These are all questions you need to ask to determine what size solar panels are right for you.